See the window below for my most recent 3d work. **See my archive (under the 3d modeling tab) for older work. Also, check out my Art Station site! So, you want to Prepare a Zbrush model for a 3d print? How many tutorials are out there that try to teach you how to print your zbrush model / sculpture and you find yourself wanting to scream and punch someone in the face? I feel your pain. I really do. That is why I will teach you step by step how to get a perfect model ready for print out of Zbrush "Every Freakin Time"! 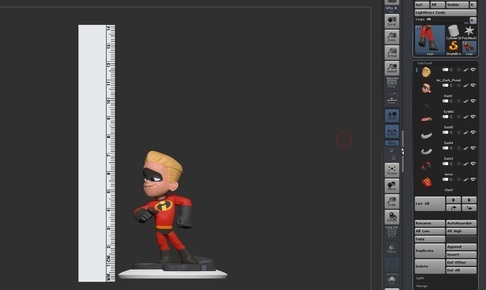 I will also teach you to ALWAYS know your scale and get your model perfect in Zbrush "Every Flippin Time"! Yes. You can feel confident knowing that you came to the right place. ​Maybe I'll even put together a video showing you...but for now... here we gooooooo! Prepping a 3d model for print in Zbrush By Bamzee. ​There are always some things that are often overlooked when prepping a 3d print. Here are a few things to think about. - toy manufacturing is a tricky thing. It is re-engineering your model in a way so that it makes sense as a toy. Toy makers are always looking at things like the fingers should be thickened up. Pointy objects can become too much of a hazard. (point tests) Body parts help support other body parts. That's the kind of thinking you need when making a print. the neck to give it added support. Make sure things like the backpack straps are penetrating into the torso, so that there aren't any open gaps. - If your character is 6 inches or so, you might consider scaling up some of your accessories such as a bowtie, a finger ring, necklace/ broach, belt buckle etc. These objects may look odd in Zbrush, but when they are a small toy on your desk, they actually look pretty cool. I included this very useful ruler and base in every Zbrush ztl. The ruler measures at exactly 140 millimeters. This ruler is how I always maintain the correct scale in the Zbrush scene. If you want your model to be bigger, just scale up the ruler. You never have to scale your subtools...only the ruler. Neat huh? - Only scale ruler/disc when setting scale. Ruler and disc are in one subtool so they are always scaled together. - The base (on top of the disc) can be scaled up or down sideways or however you want. It is it's own subtool. I personally like to add pegs to a characters feet. I also duplicate the foot pegs and scale them slightly bigger, then subtract the pegs out of my base to leave holes for the foot pegs. is that when the character is printed, the supports attach to the platform instead of my base. When both parts are done printing, I then glue the pieces together and they look real nice and clean. There are no support burs on the base to file or clean off. Basically, a monochrome print means that you are printing a model that is WITHOUT color information. What this really means is that you can have your awesome model in ZBrush in all its poly-paint glory, but as soon as you decimate your model, your color information is nuked and you now have a monochrome (WITHOUT COLOR) object. - Color info will be nuked. - I usually like each stl file to be at approx 15 - 40 megs. That is the secret Monochrome export trick. The scale will be PERFECT. Basically, a color print means that you are printing a model that is WITH color information. Yup...just like your in poly-paint heaven. - *******Remember....Only dynamesh your model...If you decimate your model, you will lose ALL the color info. That is the secret Color export trick. the scale should match perfectly.